it’s Superman! Kyle from Missing Links and Kyle and the K’Otics completes his flying flip over a group of “good sports” who volunteered to be in Kyle’s act on Sunday at the Volvo Car Open. 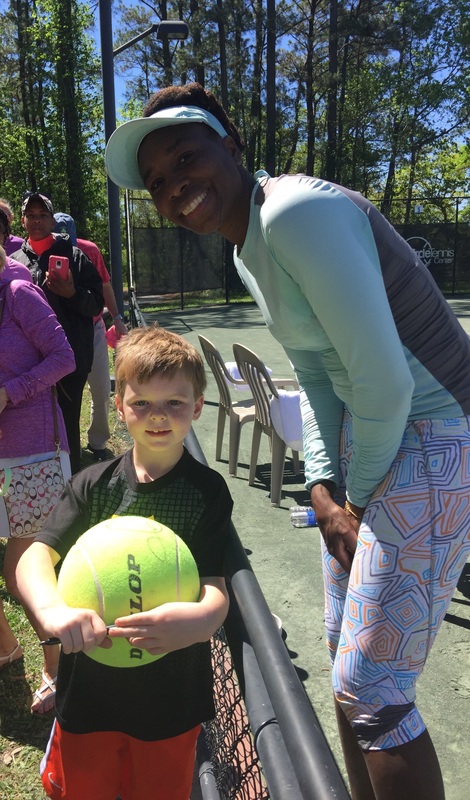 John William Hostetler of Daniel Island visits with Venus Williams after she finished her practice session on Sunday at the Volvo Car Open. Always snug with Momma Venus! Venus brought her dog to a media event on Monday. Where’d that come from?! Wow! Jacob Hoyle was excited to have a red ball pulled from his ear by Chaz the magician. Shelby Rogers meets and greets fans after the Draw Party on Saturday. Daniel Island based Peace Love Hip Hop was part of the entertainment at the Volvo Car Open Family Weekend. Children from pre-school aged to middle school performed for an attentive and wonderfully supportive group of fans.